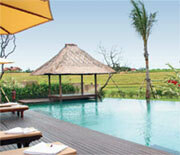 Akhyati Villas and Spa are new exclusive private villas set in a landscaped tropical garden overlooking the rice field. Akhyati Villas is located in a quite and beautiful Umalas Village. 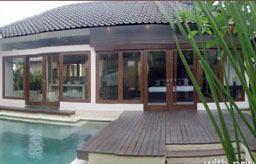 The serenity of the place ensures full comfort and privacy, whilst only 10 minutes drive from the tourist center of Kuta. Spend some quality time with your loved one in our one-bedroom villa designed for couples or come together with family or friends and stay in our two-bedroom villa. * High season supplement for December 21, 2008 - January 5, 2009.